This is an advertisement for Fraisine dentifrice. During the 19th century the primary purpose of tooth paste was actually to freshen breath rather than to clean teeth. As dentistry and oral hygine developed the idea of keeping teeth clean and healthy grew. Various substances were used from charcoal to fish paste but it was strawberries that were thought to be the most effective natural way to keep teeth clean. 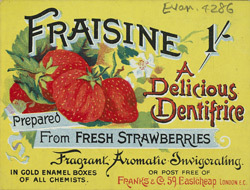 This dentifrice is actually flavoured with strawberry essence to enhance its beneficial qualities.